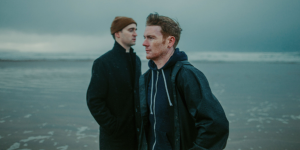 Two of Derry's most ambitious minds, Eoin O'Callaghan, AKA Elma Orkestra and Ryan Vail join forces for a Belfast performance of their collaborative project, Borders. The show takes place downstairs at The MAC, spanning symphonic ambience to widescreen electronica; a confluence of genres and the country's foremost artist-producers. Having both been releasing music independently of one another since 2012, the album is a project that has almost felt destined to happen. As two artists residing on either sides of the border in Derry/Londonderry, their paths have entwined several times in the past. Now, mirroring the spirit of the times — of grasping for unity and togetherness in an unpredictable, ultimately borderless world — Borders is a release that sees those creative paths meet head-on. Across eight tracks, from opener ‘Droves’ to the beat-laden outro ‘Arlene’, O’Callaghan and Vail masterfully blur the contours between contemporary electronic and classical realms. This breaking of new ground — of pushing boundaries and thwarting expectations via attention to detail and a joint penchant for analogue equipment — is what underpins Borders. They create a new continent of sound, a world where Borders don’t exist Though it was titled before the looming spectre of Brexit, Borders, as an album, encompasses much bigger universal themes about belonging in a world where division is more rife than ever. And yet, there’s a uniquely personal aspect that runs throughout the release. The show features video mapping, lazers, lights coming together in a fully immersive sound and audio experience. Tickets cost £16 from The MAC. Show at 8pm.